The Highlight Trifecta – amandarobots. I’ve been waiting for quite a while to do this post for the simple reason that my trifecta was not yet completed. But alas, thanks to an Hautelook sale, it is now complete. 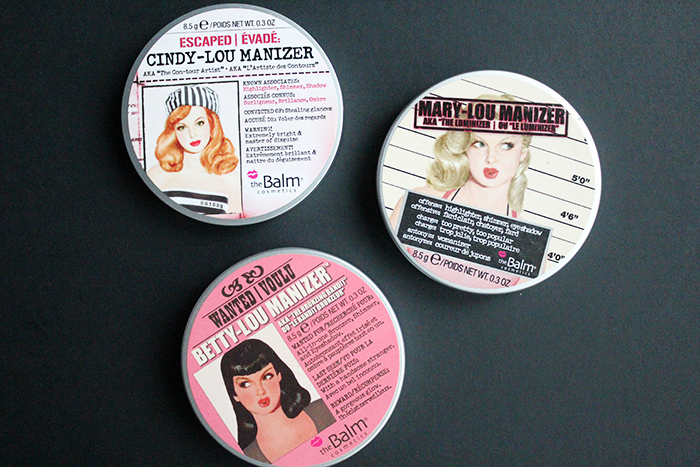 They’re The Balm’s famous highlighters: Mary-Lou Manizer, Betty-Lou Manizer, and Cindy-Lou Manizer. 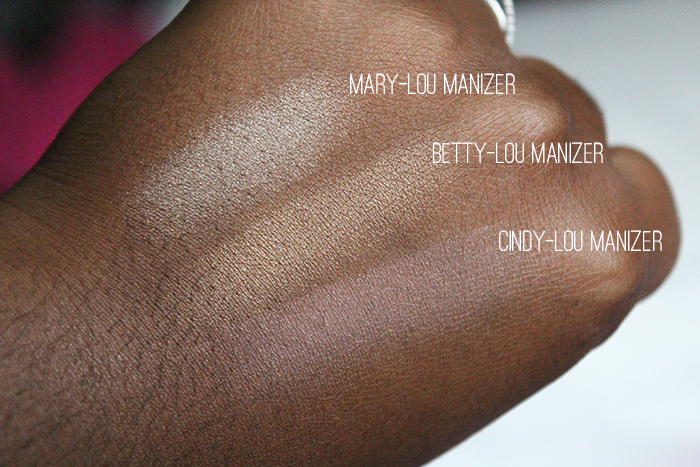 Mary-Lou is a very light champagne; Betty-Lou is a gorgeous gold, and Cindy-Lou is supposed to be rose gold. I purchased Betty-Lou Manizer first. Of the two that were out at the time, it seemed like it would flatter me the most. Marketed as a bronzer (but way too shimmery for anyone to bronze with on the daily), it’s close to my natural skin-tone and the gold enhances my yellow undertones in all the right ways. When I want a subtle glow, I go light; when I want to glow like Beyoncé, I’m quite heavy-handed with it. 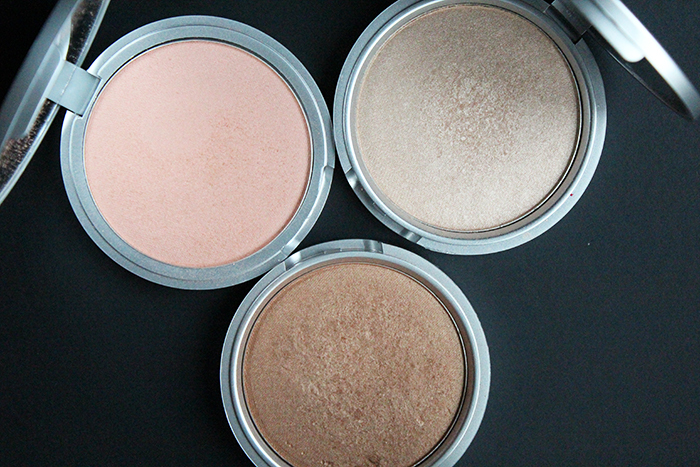 It’s pigmented, buttery, and blendable. It applies like a dream. Mary-Lou Manizer came next for me, although I believe she was the original in the line. I was sure this would pull frosty on me, and although she’s not as flattering as her sister Betty, it’s still beautiful with a very light hand. The texture is comparable to that of Betty-Lou Manizer. When I heard about the launch of Cindy-Lou Manizer, I was so excited. The Balm launched it riiight at the peak of what I like to call Rose Gold Madness. Rose gold was everywhere: on your wrists, on your purse, on your eyelids, and now, your cheeks! I waited until the hype died down, then picked it up on Hautelook last month. Compared to the other two, Cindy-Lou Manizer is less pigmented and a smidge on the chalky side. I apply all three exactly the same way: I stamp a duofibre brush right into the product, stipple it a bit, then mimic the same motion on my cheek. When I stamp my brush in this product, some of the product goes flying around in the air and in the pan. Overall, they seem to have deviated from the formula of the other two, and if there’s a third Lou Manizer, I hope they return to the old formula, which was much smoother and more pigmented. On the plus side, the iridescent pink tone to it makes it fun to layer over other blushes, to see what the end result is. It turns my purple-y blushes more pink, and gives my mauve blushes a bit more life and colour. Overall, I’d certainly recommend Betty and Mary over Cindy because the formula is far superior. However, if you’re looking to spend under $30 to get that glow, The Balm is out there killing it in the highlight department *power fist emoji here*.